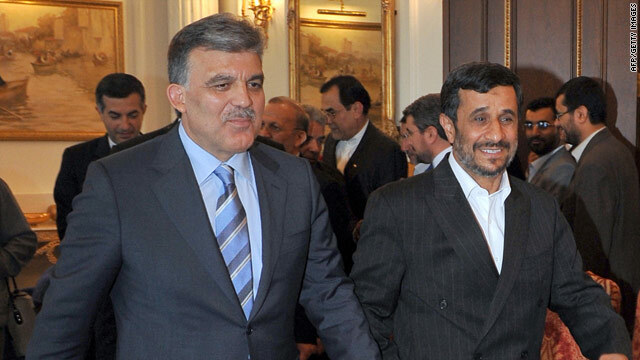 Iranian President Mahmoud Ahmadinejad, right, pictured with Turkish President Abdullah Gul on Monday. NEW: Draft resolution slapping tighter sanctions on Iran circulates at U.N.
Istanbul, Turkey (CNN) -- -- Iranian President Mahmoud Ahmadinejad lashed out at Israel and warned the United States against pushing for new sanctions on his country a news conference on the sidelines of an Asian security summit here Tuesday. A key item on the agenda at the summit is last week's Israeli raid on an aid flotilla in the Mediterranean. Ahmadinejad said the confrontation revealed Israel's "devilish" nature. "It showed violence and hatred and war-mongering attitudes," he said at the news conference. "The devilish sound of the uncultured Zionists was coming out from their deceit. ... They were holding up the flag of the devil itself." The raid led to the deaths of nine people, all Turkish citizens -- including one Turkish-American. Turkey is urging Israel to accept an international probe into the incident. Ahmadinejad congratulated Turkey, which has been in a war of words with Israel following the raid, for its response. Israel's envoy to Turkey later walked out on an Ahmadinejad speech at the conference. Ambassador Gabby Levy walked out in protest when Ahmadinejad started criticizing the "Zionist regime," said Amit Zarouk, a spokesman for the Israeli Embassy in Ankara. Both Israel and Iran are members of Conference on Interaction and Confidence Building Measures in Asia (CICA). Ahmadinejad and Levy did appear together in a group photo of delegates to the conference, along with dozens of other attendees. "Beleaguered" was how one Western diplomat described Levy's disposition during Tuesday's meeting. Host country Turkey, once Israel's close Middle Eastern ally, has called on member countries to condemn Israel's raid on the aid convoy. The incident has pushed Turkey to side with Israel's enemies Iran and Syria, in harshly condemning the Jewish state. Russia, which is also a member of CICA, condemned the attack as well, Prime Minister Vladimir Putin said in remarks carried on Russian state TV. "Generally speaking, such actions against civilian vessels are unacceptable," Putin said. "The fact that they were conducted in neutral waters raises many questions, and the incident must be thoroughly investigated. We are sorry for the victims of the incident, and we hope nothing of this kind will happen again." Iran's nuclear program has been another major topic at the summit. The United States expects to bring a new resolution on increased sanctions against Iran over its nuclear program to a vote in the United Nations Security Council this week. A draft resolution saying Iran had failed to meet international requirements and U.N. resolutions was circulating at the world body on Tuesday. CNN obtained a copy from a Western diplomat. The resolution -- which could still be changed before it comes to a vote -- is set to call for tighter restrictions on people, companies and organizations, including the Revolutionary Guard Corps. The targets of the sanctions are still being worked out, the diplomat said. By calling for a resolution instead of sitting down for talks with Iran, the United States is "gravely mistaken," Ahmadinejad said. "Within the framework of respect and justice, we're ready to negotiate with everyone. Anyone who is going to resort to the language of force and aggression, the response is clear," he said. Ahmadinejad went on to commend Turkey and Brazil for recently negotiating a deal with Iran on a uranium enrichment swap. "The initiative marked the beginning of a new path -- the beginning of an end to unilateralism in the world," he said. The United States, he added, missed an opportunity by not embracing the deal. Putin said sanctions against Iran should not be "excessive, or put the Iranian leadership, and above all the Iranian people, in a false position that would put obstacles in the way of Iran's peaceful nuclear energy development." Asked whether the raid on the flotilla last week will change the way countries vote in the Security Council, Ahmadinejad said the raid will actually change many things. For Israel, he said, "it has actually rung the final countdown for its existence. It shows that it has no room in the region and no one is ready to live alongside it. Actually, no country in the world recognizes it, and you know that the Zionist regime is the backbone of the dictatorial world order." In fact, many countries recognize Israel. He added, "Maybe at the Security Council, it will impact temporarily. The Zionist regime, with what it has done, it actually stopped its possibility to exist in the region anymore." CNN's Ivan Watson and Maxim Tkachenko contributed to this report.